Welcome to the October edition of Reactor-88's Custom Corner! This month we’re highlighting Thomas S. Durdella, aka Infinite Rabbits. Thomas lives in Cleveland, Ohio, with his wife and daughter. Thomas’ background is in history and architecture, and has been professionally employed in the architecture, art, and graphic design fields. He has been working with designer vinyl toys for about four years, but painted, sculpted, and kit-bashed toys & models since he was a kid. As a teenager, Thomas worked in a comic book store for a few years. From that experience he developed a fondness for artists like Bill Sienkiewicz, Dave McKean, and others doing fully painted and/or collage in comics. In college Thomas was a professional toy soldier and war gaming miniature painter (he still accepts some commissions for those.) From those formidable years he tried various materials, gained a lot of experience, and really polished his technique. That world also exposed him to illustrators and artists like John Blanche and Ian Miller. There’s a lot more that’s impacted Thomas’ art and he’s carried it all through the years in to what he creates today. He is currently trying to spend more time on art and toys because that’s where his heart lies and he feels his strongest talents are. As the demand for Thomas’ work keeps increasing, he hopes to be doing it full time in the very near future. And while the focus here is on custom vinyl (and resin) toys, he has an expanded repertoire that includes a variety of 2D and 3D media. Thomas does take commissions, so if you’d like to contact him about a project or if you’d just like to keep up with his work, he can be contacted via email or found at the Infinite Rabbits Website, Infinite Rabbits Store, and various social outlets: Instagram, Google+, and Facebook. Last year, James started getting into molding and casting. 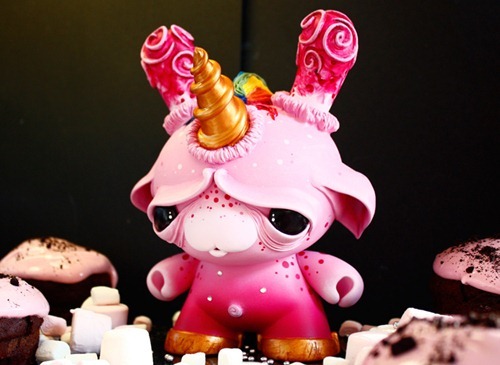 He created a small resin base figure called the “Lil’ Jammie” and is looking forward to expanding the line. 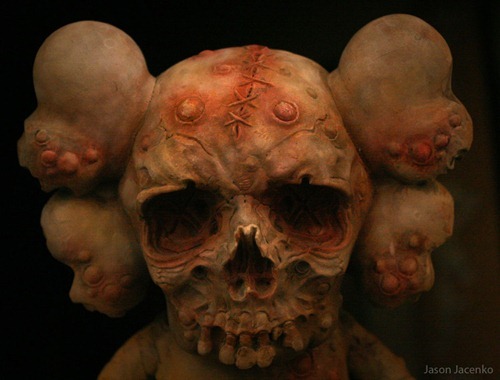 James is currently working on a 6-inch resin figure that he will be releasing in October featuring his signature character “Grrr…” On top of that he’s moving towards making more masks and monster fabrication, as well as getting involved with 3D printing. James does take commissions, so you can contact him and follow his work at all the usual places: Instagram, Facebook, Twitter, the Fuller Designs website & blog, as well as his online store. Welcome to the August edition of Reactor-88's Custom Corner. This month we’re highlighting Justin Phillips, better known as JFury. Justin hails from Central California where he is a professional dog trainer, specializing in aggression and other behavior problems. He has been painting toys for about three and a half years. Before he started customizing toys he had never painted in his life, so he’s learned a lot along the way and is still learning new things each time he paints a new custom. Justin’s style is very cartoon-driven and he’s known for his clean line work and vibrant colors. His three kids are a huge inspiration for his character designs. His wife pushes him and is also his biggest critic- she has no problem telling him when something doesn’t look right. I think she’s doing a good job because Justin comes up with some cool characters with clean, technical execution. He does take commissions, so if you’d like to discuss a project with Justin, he can be emailed at [email protected]. You can also keep up with Justin and his work on Instagram, Twitter, Facebook, and the Furious Customs online storeFurious Customs online store. Welcome to the July edition of Reactor-88's Custom Corner. This month we’re highlighting David Bishop, better known as RunDMB. David lives in Chelmsford, UK where he is the creative director at a design agency he started about sixteen years ago. 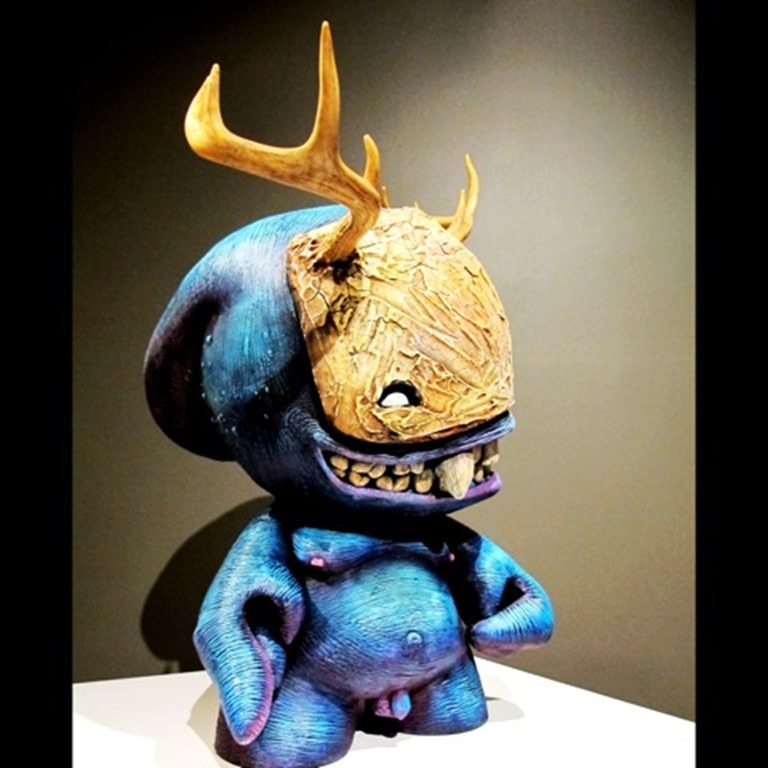 He has been painting toys since 2011 and is a member of the very talented Red Mutuca Studios art collective. Welcome to the June edition of Reactor-88's Custom Corner. This month we’re highlighting Tasha Zimich. Tasha lives in Vancouver, Canada, where she is the Operations Coordinator for d’Errico Studios Ltd, an ABA Therapist, and a painter & toy artist. She has an academic background in contemporary art, though producing art has been a part of her life since her childhood. 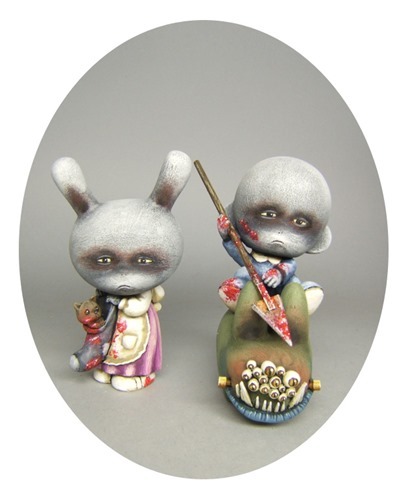 She became aware of the art toy scene in 2009, and painted her first toy in 2011. Tasha felt she needed an in-between that balanced her critical theory in academics and her personal passion from early years of drawing and painting- custom toys became the vehicle to drive that. Tasha does all her painting by hand with acrylics & brushes, and has a very colorful, “painterly” style that really draws your eye in to examine each piece more closely. When it comes to inspiration, she never really outgrew comics and cartoons, and is fascinated by horror books/film and the natural world. Bits and pieces from these different areas tend to come together in disturbing and adorable ways in Tasha’s work. She does take commissioned projects, so if you’d like to discuss a project or just keep up with Tasha’s work, you can visit her website at www.tashazimich.com, or find her over on Facebook and Instagram. I really like Fiona’s work- the sculpting and finishes are spot on and really give the feel that her creations fell right out of a Medieval/sci-fi/fantasy world. For sculpting she usually uses a mix of polymer and epoxy clay, and she experiments with various types of acrylic paint to create her interesting textures and washes. Fiona has learned a lot since she started customizing, and she’s always on the lookout for better techniques and materials to work with. Fiona is currently taking commissions, so if you’d like to contact her to discuss a project you can email her at [email protected] If you’d like to learn more about Fiona and her work, be sure to check out her website, and follow her over on Facebook, Instagram, and Twitter. Welcome to the April edition of Reactor-88's Custom Corner. This month we’re highlighting F1shcustoms, which is comprised of brothers Joey & Matt Fiscella. The Fiscella brothers are full-time artists originally from Port Chester, New York, but they now reside in Lawrenceville, Georgia. Joey & Matt don’t have any formal art training and got into custom toy making about six years ago just to see what it was all about. They both love comics, video games, and pro wrestling- which is heavily reflected in their body of custom toy work. An interesting fact that the brothers wanted to share --- they both hold a pen with all five fingers, and didn’t even know each other did this until recently. While they were compelled to correct this during their younger years, they resisted and at present still do it this way. For them holding a brush like that makes painting much easier. When you look at their work, you will see that they really have excellent control over their brushes -- their custom toys have an extreme amount of precision and is very crisp. Their work looks like it just popped out of the pages of a comic book. While Joey & Matt started painting toys for themselves, nowadays the majority of their work goes straight into collectors hands. If you’re interested in getting your hands on some of their work, you can contact them at [email protected]. For pricing and more info, head over to their website, or you can find them at the usual social spots- Facebook, Instagram, and Twitter. Welcome to the March edition of Reactor-88's Custom Corner. This month we’re highlighting April Elliott, or better known as MaloApril to the toy community. April is a full-time artist based in North Fontana, California. She remembers making art since the age of 10, where she grew up on a block that consisted entirely of her family. April would hang out in her grandfather’s garage and create for hours each day. She began painting toys around 2008- starting with Mighty Muggs and then moving to other platforms. April loves going to shows and events and getting to know other artists- seeing their work and hearing their stories is what inspires her. April is mainly known for her Sugar Skull designs, but she also likes to branch out and explore new ideas from time to time. Regardless of the design direction she takes with a piece, they all have the same attention to detail that really makes her work stand out. The lines are very clean and precise, color palettes are well balanced, and sculpted accents add that final bit that really bring each piece together. April does take commissions, so if you’re interested in contacting her for a project you can email her at MaloCustoms[at]gmail[dot]com. If you’d like to follow along with her work, be sure to like her Facebook page and follow her over on Instagram. Welcome to the February edition of Reactor-88's Custom Corner. This month we’re highlighting Jenn and Tony Bot. The Bots are full-time artists based out of Fort Thomas, Kentucky. Jenn and Tony have only been creating custom toys for a little over a year now, but have already created over a hundred and fifty -- impressive stuff! The Bots describe their work as Kawaii Pop! This comes from their love of Japanese style and pop culture. If you’re familiar with Jenn and Tony’s work, the first thing you notice is that it’s different that most custom toys out there. Instead of paint, they cover each piece in polymer clay. This adds a level of dimension and really gives each piece a full sculpted feel. Another interesting tidbit is that they hand-mix all their clay colors. Jenn and Tony are always excited to work on new projects, so if you’re interested in a commission, feel free to email them at [email protected]. You can also find them individually: @thejennbot and @thetonybot on both Instagram and Twitter, as well as at their combined Facebook Fan Page. Welcome to the January edition of Reactor-88's Custom Corner. To kick off 2014 we're highlighting Jan Calleja. Jan is a freelance graphic artist and toy customizer based in Quezon City in the Philippines. Jan has been customizing toys for five years now, and recently quit his full-time job in advertising so he could have more time experimenting with his custom toy creations. Jan has a very interesting style of blending together toys with other recognizable machinery, whether it be an airplane, a car, or weaponry to create some very unique pieces. He usually does a lot of research before starting a piece, so there is some rationale behind his designs. At first toy art didn’t really click with Jan, but with his new found passion of creating these toy/machine hybrids, he now gets it. Jan still goes back and forth on whether to call his finished pieces toys or sculptures that have a toy-like appearance. Regardless of the label, I feel Jan’s work has wide-reaching appeal and he definitely has a bright future ahead of him. Jan doesn’t have a website yet, but if you’d like to contact him about a commission, you can email him at [email protected] or send him a message over on his Facebook page. To see a full gallery of his work, I highly recommend you check out his Flickr page- amazing stuff! Welcome to the December edition of Reactor-88's Custom Corner. This month we're highlighting Rask Opticon. Rask is a full-time artist based in Los Angeles, CA. He mainly focuses on customizing vinyl toys, but also creates a lot of 2D work -- paintings, digital art, tattoos, and graffiti/spray art. 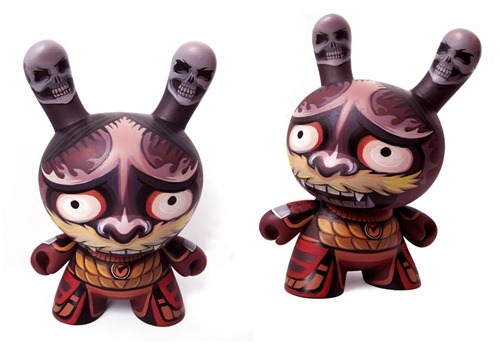 Rask started painting toys in November of 2012, when he was introduced to the Disney Vinylmation platform by a friend. 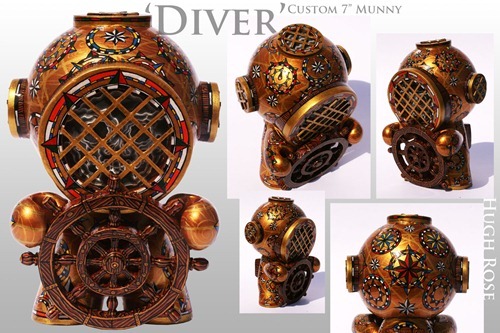 In the beginning the bulk of his client work was Vinylmation toys, but earlier this year he jumped over to the Munny platform to create some personal pieces for Kidrobot’s annual Munnyworld contest. With that he began taking toy customizing a lot more seriously and really began immersing himself in the toy community. His style is influenced from graffiti, video games and cartoons/anime. Rask used to airbrush at a mall shop that he and a friend ran for five years, so it makes sense that he primarily uses one to create his pieces. Though he will come in with a regular brush for all the sharp edges and line work. He likes to keep the integrity of the toy, so if possible he’ll usually keep sculpting to a minimum. To contact Rask or check out more of his work, head over to his website at www.distortionoflife.com. He can also be found over on Facebook and Instagram. Welcome to the November edition of Reactor-88's Custom Corner. This month we're highlighting Kong Andri. Kong hails from Jakarta, Indonesia, where he’s a creative partner in a small graphic design studio. 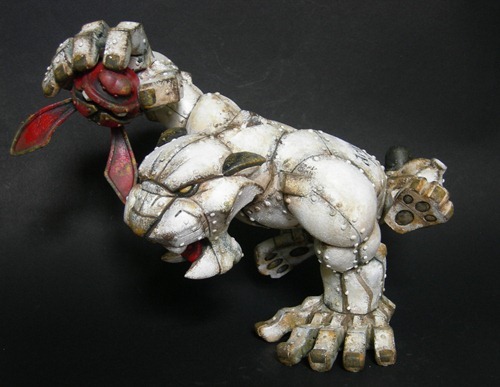 Kong has been painting custom toys since 2009. He gets inspiration from his 5 year-old son, so a lot of his creations lean towards cute themes, happy people, and robots. He also likes to utilize bright colors to evoke a feeling of happiness from everyone that sees his work. I must agree as I really enjoy looking at his creations. Obviously others do as well since Kong has a production piece in the upcoming Android Series 4. 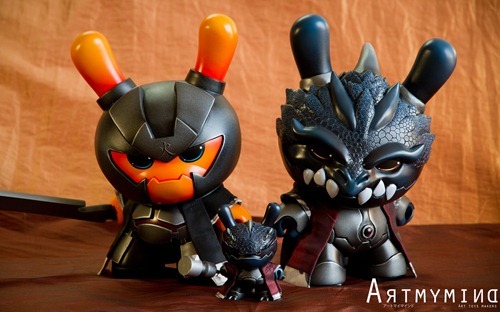 It’s hard to believe that some of his custom works are not production toys- the precision in his Christmas and Uncle Chop Dunnys are amazing. Then there’s things like his Snap Kit Munny custom- growing up as a model kit builder that brings back memories. While Kong does not take commissions, if you’re interested in purchasing his work keep an eye out on his online store, as that’s where all his fabulous creations end up. If you’d just like to follow his work, you can check out his website or find him over on Instagram. Shadoe does take commissions, so If you’d like to contact him to discuss a project, you can email him at ShadoeDelgado[at]gmail[dot]com. He’s also has a series in the works that he’s hoping to release around Designer-Con, so if you like more info on that or just want to keep up with his work, be sure to check out his website: www.ShadoeDelgado.com. He can also be found on Twitter, Instagram, and Tumblr, and of course Facebook. Welcome to the September edition of Reactor-88's Custom Corner. This month we're highlighting Igor Ventura. Igor resides in Sao Paulo, Brazil and is a motion graphics designer for a video studio. Having a full-time day job, Igor finds time during the night and weekends to work on his custom toy art. 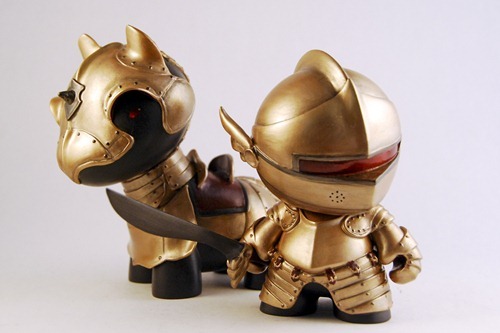 Igor and friend Sergio Mancini founded Red Mutuca Studios -- a design collective featuring some very talented artists and A-list toy customizers. Igor started as a collector in the designer art toy world around 2007, and opened an online store called Banana Suicida with Sergio. 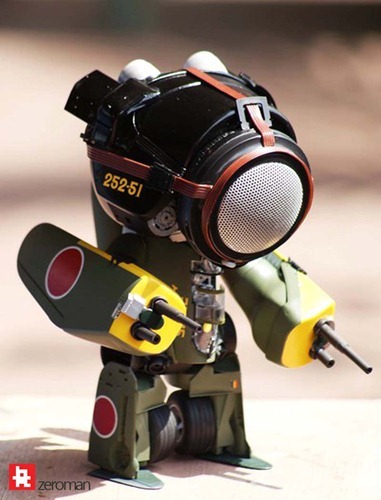 In 2008 they both entered a Brazilian toy design contest and had their designs selected, which they then customized on 8-inch Qees. That was his first custom toy and he has kept going ever since. Igor's earlier work was more focused on political critique- incorporating concepts from both Capitalism and Communism to show people we should try to live peacefully with our differences. But finding himself not entirely politically engaged, he decided to change the focus of his work to more fun, playful, and weird concepts. Though on occasion he still tries to convey a message to society with his work. One thing to note about his custom toys is that he has never felt satisfied with the way he painted noses on his pieces, so a few years ago he made the decision that most of his pieces would not have noses. Funny, as I've always liked the noses on Igor's work- that along with his heavy line, cartoon-friendly style. Igor takes commissions, but with a full-time day job it can take him a while to complete pieces. If you'd like to discuss a project with Igor, he can be reached at [email protected], or to follow Igor's work, head over to redmutuca.com. He can also be found on all the usual social media sites- Facebook, Twitter, and Instagram. Welcome to another edition of Reactor-88's Custom Corner. For August I'm featuring Mike Die. Mike resides in Staten Island, NY where he works as a manager for a major retailer. He loves spaceships and DJ Whattie, and has a tremendous collection of custom Dunnys. Mike started painting toys back in 1996, but took a break after a few years to focus on his career. In 2010 he returned to painting and hasn't looked back. Being a self-proclaimed secret government robot gone awry, Mike's toy work is focused on robots. 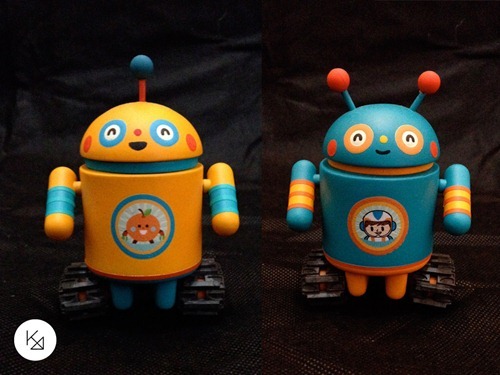 While robot toy designs can be a dime a dozen, Mike's work really stands-out with his signature details. All his customs have their heads turned backwards, and most have some sort of felt accessory wrap or hat. His paint work is top notch as well- ultra-clean line work on top of lightly textured base colors really make his robots stand out. Mike is always open to commissions, so if you'd like to discuss a project with him you can contact him via email. To check out more of Mike's work you can follow him over on Instagram or Twitter, and for you Flickr folks he can be found here. 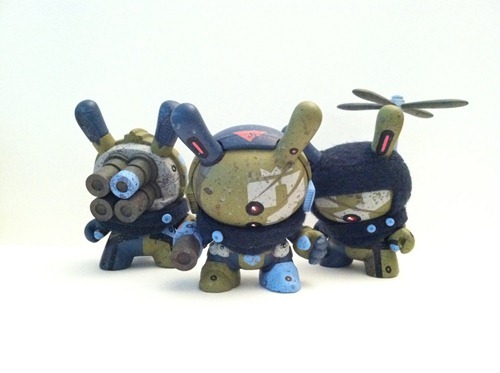 Also, be sure to check out Air Pirates- a custom blind-box 3-inch Dunny series curated by Melodreama and Mike. It features seventeen artists reinterpreting classic and modern Disney (and related) characters. The series features pieces from Melodreama, Bill Hewitt, Bryan Collins, Camhunas, DeeTen, Flawtoys, Guillermo Perez, JC Rivera, Komega, Krunster Girl, Lisa Rae Hansen, Matthew Reid, Jenn and Tony Bot, Mike Die, One Eyed Girl, PJ Constable, Shadoe Delgado, and To Design. These are currently available over at Mike Die's online store. Welcome to the July edition of Reactor-88's Custom Corner. This month we're highlighting Mike Fudge. 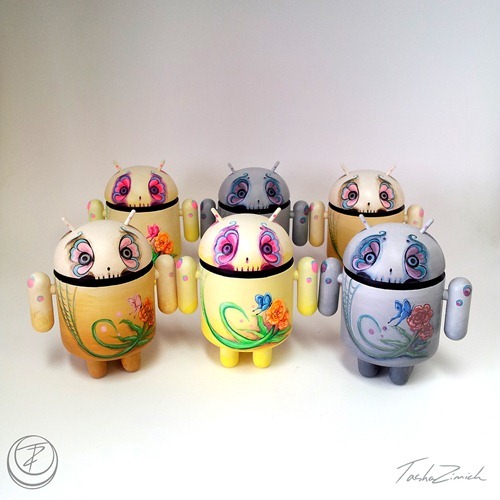 Mike is a Denver-based artist who is fairly new to the world of custom toys. His main body of work is mostly high-contrast black and white illustration, but he started customizing toys earlier this year. Mike made a big jump into the art toy world having his custom work on display at each of the Kidrobot retail locations back in June. At first glance it would seem he has a very loose, free-flowing style, but on closer inspection it's apparent his lines are very clean and deliberate. His characters are grounded in traditional animal and Native American imagery, and they have a very organic and a slightly abstract feel which gives off a very spiritual vibe. Another interesting aspect is that all his characters have white eyes- this definitely adds to the mystical, other-worldly quality of his designs. While I really enjoy Mike's custom toy work, his illustration work is also very impressive and is definitely worth a look. If you'd like to learn more about Mike or drop him a line, head over to his website. He can also be found over on Facebook and Instagram. I'm sure we'll be seeing a lot more of Mike as he's slated to be in some upcoming group shows and has some other fun plans for 2014. I LOVE bunnies. I collect bunny things, I wear a bunny onesie all day, I've got bunny tattoos, and I have a fat grey bunny named Butters that lives in my studio. Seriously, if you want something done to do with bunnies CALL ME NOW! LET'S BE BUDS! I am really scared of small birds, moths, and butterflies. Oh my god! Get them away from me! Don't let them near my face! I am a big wartime history buff. I've got a WWII air raid shelter in my basement studio. I used to play guitar, but now I couldn't play a note if I tried. Laura can be found on Twitter, Instagram, and Vine as HausofBoz- there you'll get exclusive announcements and updates, WIP shots, and workspace tours. On Facebook she can be friended via Haus Ofboz. Her online store is over at Hausofboz.bigcartel.com, and if you just walk to take a leisurely tour of all her custom toys, drawings, plush and other artwork head over to www.hausofboz.co.uk. Welcome to the May edition of Reactor-88's Custom Corner. This month we're highlighting Hugh Rose, who resides on the small island of Guernsey. If you're not familiar with Guernsey, it's a British Crown dependency located in the English Channel. One bit of Guernsey trivia- it is the only English soil that the Nazis conqured during WWII. It's a very unique place and has been very inspirational to Hugh, who started making toys about four years ago. 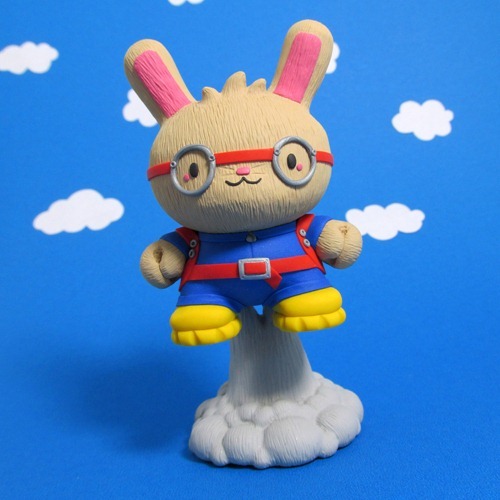 Hugh helps out at a local school art department in the day, and afterwards treks to his studio to continue with his passion for making custom toys. A lot of Hugh's toys have a classic nautical theme, which I really enjoy and of course makes sense living on a tiny island. Along with very nice, subtly sculpted additions, many of Hugh's pieces are jam packed with tons of detail - it's easy to get lost in each piece just staring at all the intricate paint work. I can only imagine how long it took him to finish his "Once and Future King" Munny. Hugh mainly creates for shows and direct sales through his site, but he is taking commissions at the moment. If you'd like to discuss a project with him, he can be reached through his site at www.hughrose.co.uk or directly via email. If you'd just like to admire Hugh's work, you can follow him on Twitter or friend him over on Facebook. Welcome to the April edition of Reactor-88's Custom Corner. This month we're highlighting Charles Rodriguez, who hails from Caracas, Venezuela. 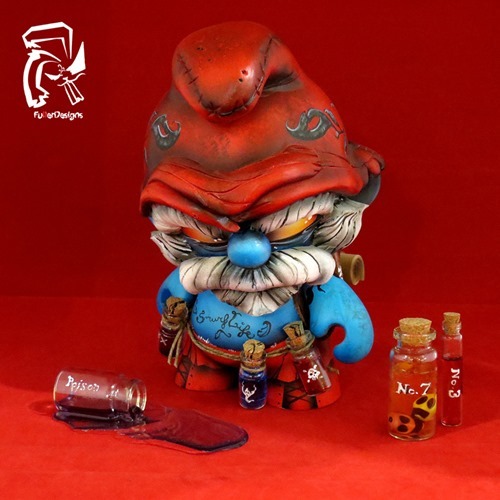 Charles is a trained graphic designer who has been working as a creative director at an international advertising agency, though he recently left his job to focus full-time on his custom toy art. He's also a new member of Red Mutuca Studios, which is jam packed with talented folks such as Sergio Mancini, Grimsheep, and many more. One of the first things you'll notice about Charles' work is that none of his creations have eyes. While many folks utilize the eyes of their characters to bring out emotion and set a mood, Charles focuses on a heavy, defined brow to set the tone of his pieces. He also adds a lot of texture to his work with a very interesting raised hair technique, along with very precise carved-in fur and other details. 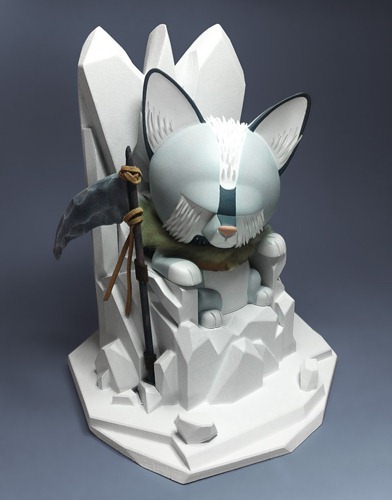 On top of that, I really love that he sometimes creates a larger scene for his pieces, such as the ice throne he created for his Amarok Fonzo Custom- amazing stuff. If you enjoy Charles's work as much as I do and you are interested in working with him, he can be reached via email for commission inquiries. If you'd like to keep up with him and his work, he can be found on Twitter, Instagram, Facebook, and Behance. Welcome to the March edition of Reactor-88's Custom Corner. This month we're highlighting the dynamic duo of Julia and Guillaume Lachambre, aka Artmymind. They are full-time French artists currently working out of a secret lair in Poland, where they create custom vinyl toys and original resin figures, as well as some other crazy projects that will be revealed later this year. They have a strong love for Asian culture- it is an important source of inspiration and influence in their artwork. They also love Sashimi, so it's fitting that Japan was the birthplace of Artmymind and location of their first studio. I first came across Julia and Guillaume's work last year and was immediately blown away by what I saw. While their creations are still toys at heart, they could easily be confused for museum-quality works of art. The level of detail and craftsmanship in their work is amazing- I can only imagine the amount of time and effort that goes into each creation. And the toy community has taken notice as well- you can purchase pieces from the their online store, though the majority of their work is currently sold out. They also have a very long commission list, but don't let that stop you from emailing them to discuss art, collaborations, or future projects. If you'd just like to keep up with them and their fantastic work, they can be found in the usual places as well- Facebook, Twitter, Instagram and their blog. Welcome to Reactor-88's Custom Corner. For February, we're highlighting WuzOne. WuzOne (who's real name is Jose) is from Seville, Spain, where he's a practicing psychologist and avid basketball player. Jose became aware of art toys back in his graffiti days, but didn't start painting them until 2008. Since then Jose has painted and sold more than 400 custom toys. He's also appeared in many gallery shows across the globe and of course had work showcased at our favorite toy mecca- San Diego Comic-Con. Jose is inspired by typography, Arabic calligraphy, music and cartoons. Speaking of cartoons, WuzOne is probably best known for his pop-culture customs, but it seems more and more he's developing his own very interesting style. On the surface they appear to be monster-ish figures with eyeballs as a recurring theme, but beyond that the colors, abstractness, and complexity really make the pieces. I think his three most recent pieces are probably my favorites, as he continues to push his work in new directions. If you'd like to see more of WuzOne's work, head over to his Flickr or Behance page. Of course he can also be found on Facebook and has an online store presence as well. Lastly for commission inquiries, he can be reached via email. Welcome to Reactor-88's Custom Corner. To kick off 2013, we're highlighting long-time customizer Southerndrawl. SD is originally from Texas (hence the name) but calls New Jersey home. He's got a non art-related day job, so to get his creative fix he toils away at his craft during the wee hours of the night. Before entering into the realm of customizing toys, SD was carving his own wooden toys and figures. One day he hopes to return to wood carving, but for now it's just about the vinyl toys. One of my favorite things about Southerndrawl's work is his style of meshing the mechanical with the organic. He focuses on animals for his subject matter, giving them a real-world feel- they're weathered and worn as if they've really been living out in the wild for years. 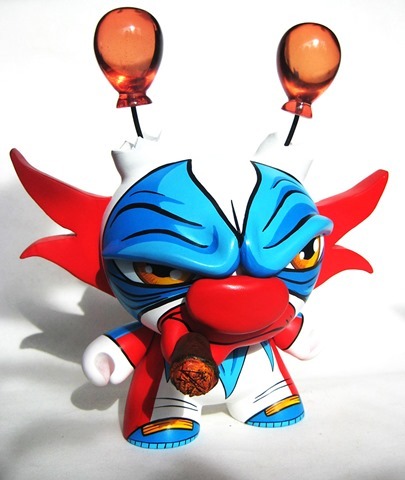 While the majority of SD's work revolves around this style, a few years back he totally changed things up and created a set of old-time circus characters- to this day those are still some of my favorite mini customs. In case you were wondering he does take commissions, although he tends to shy away from Mad*Ls and 3-inch Dunnys (but loves Teddy Troopers.) To see more of Southerndrawl's work, check out the pics below. If that doesn't satisfy you or you'd like to contact him for a commission, head over to the Southerndrawl blog or Flickr page. Welcome to Reactor-88's Custom Corner. To wrap up 2012, we're highlighting Björn Eding, aka Otto Björnik. Björn resides in the Philippines and is a trained architect, but has pursued a career as a designer/illustrator with much success. 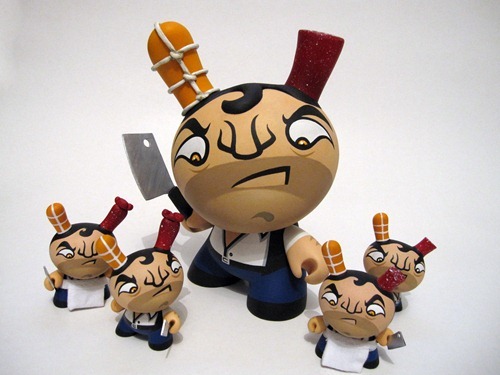 Björn came across the vinyl toy scene back in 2009, but didn't actually start toy customizing until a few years later. Hoping to realize his dream to be a painter, his early works were more just exercises with acrylics. At the same time, he experimented with transferring his character illustrations to toys and that definitely clicked with the toy community. My first glimpse of Björn's work was his very impressive Dunny chess set. Looking beyond the shear feat of creating an entire set of chess custom toys, his actual designs stood out as very unique. They have a very classic, delicate, and whimsical look- almost as if they stepped right out of an antique fairytale book. He also sticks to a very minimal palette- usually focusing on black and white and sometimes one accent color, which also accentuates the old world feel. And while I'd like to keep this totally focused on toys- his 2D pen and ink artwork is phenomenal and should definitely be checked out as well. So to peruse all of his work and much more, head over to the Otto Björnik website. Welcome to Reactor-88's Custom Corner. For the month of November we're highlighting Jason Jacenko. Jason runs 626ink- a custom tattoo studio and gallery in Melbourne, Australia. He's been tattooing for twenty years and has been a standout in the custom toy scene for as long as I can remember. His work leans toward the creepy, but even his scariest characters always seem to have some lovable quality to them- I think it's the eyes. The most impressive aspects of his work for me are the accuracy and attention to detail that he injects into each piece he creates- they almost look alive. Also, the texture and depth in his work can look so realistic it's easy to forget you're looking at a flat toy surface. So if you're like me and want to make sure you don't miss any of Jason's work, be sure to friend him over on Facebook - he shows some great work in progress shots. If you'd like to purchase one of Jason's paintings or custom toys, be sure to check out his new online store. Welcome to Reactor-88's Custom Corner. Before October rides off into the sunset [ed: Due to lag on our end, cut this one really close], we're highlighting another fantastic toy customizer- Nena Nguyen. Nena is a small, quirky girl from Vancouver, Canada, who stuffs her face in finance textbooks during the day and vibrant Createx colors during the night. 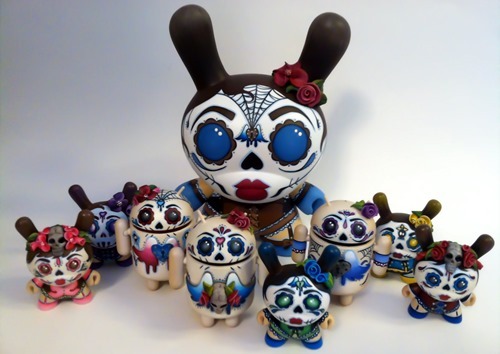 Her passion for customizing began at the age of 16- back then it was about hitting up Mini Munnys with markers. Since then, Nena has really pushed to improve the quality of her work with eye-catching color combinations and interesting characters. I found Nena's work earlier this year and have to agree- her interesting character design, nicely sculpted enhancements, and striking color palettes really draw you in and force you to give her work a second look. I am definitely going to be keeping an eye on Nena as she continues to turn out some very impressive work. If you'd like to keep tabs on her as well, be sure to check out Nena's website.